Between 1910 and 1916, Elizabeth Spencer was the most prolific vocalist on Thomas Edison’s staff, recording in wax cylinder and the Diamond Disc formats. The youngest of four children, Spencer was born Elizabeth Dickerson on April 12, 1871; her father died eight months later. In 1874, her mother remarried to Col. William Gilpin, who served as the first governor of the Territory of Colorado in 1861. The family moved to Denver, where she learned to sing, recite stories and poetry and play piano and violin. She graduated from St. Mary’s Academy and married Otis Spencer, an attorney. A recognized society woman, Spencer sang locally and got her big break in 1905, performing a successful solo act at the Orpheum Theater, Denver’s major vaudeville house. Her acting ability led to roles in Broadway road companies. By 1910, she was residing in New York City and making her first recordings for Thomas Edison, becoming his company’s most prolific studio artist; her 661 sessions were more than any other vocalist. 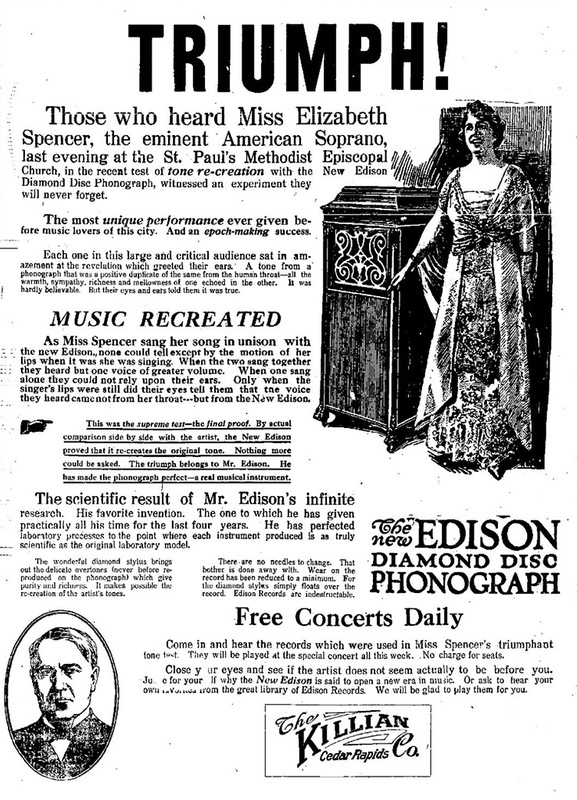 Adding a disc format to the product line, Edison’s Diamond Disc reproduced her singing quality with such superior accuracy that Edison used Spencer for public Tone Test demonstrations. She filled theaters and auditoriums around the country, greeted by dealers and thousands of Edison phonograph owners, to demonstrate the superior qualities of his sound reproduction equipment. Edison closed the record division in 1929. Spencer died in New Jersey in 1930, ten days after her 59th birthday.